Clinical trials and their participants have revolutionized Parkinson’s treatment, and have changed the lives dramatically of those affected. They have made available treatment including levodopa, dopamine agonists, MAO inhibitors, COMT inhibitors. All these medications have been approved because people have participated in trials. They’ve improved the delivery methods of medications such as long-acting formulations of medication, patches, infusion pumps, inhalable medication. Deep brain stimulation, the role of genetics in Parkinson’s, the importance of exercise in Parkinson’s—all thanks to clinical trial research. 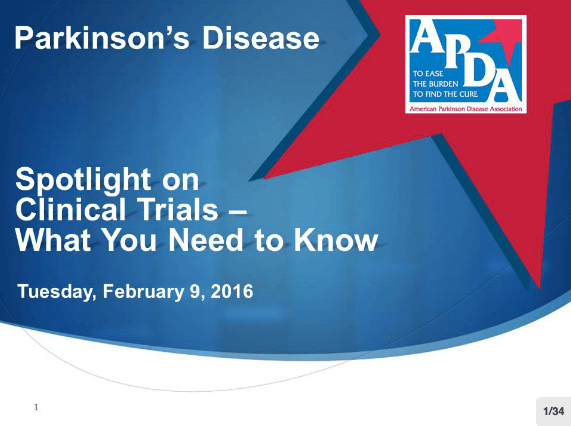 Clinical trials are vital to the future of Parkinson’s research, and APDA wants to foster their continued existence. We hosted a webinar on February 9, 2016 with Dr. Marie-Hélène Saint Hilaire and Nurse Ray James to explain the critical role clinical trials play in Parkinson’s research and how to get involved in clinical trials. Clinical trials are studies in which a group of participants receives a specific treatment—medications, surgeries, even non-medical treatment. The researchers then assess the intervention, and whether the treatment is beneficial or not. How these findings can be applied from the small group of patients on which the medication was studied to the general population of patients who have that disease. To better explain how clinical trials fit into the landscape of Parkinson’s treatment and research, here are some examples. We test new Parkinson’s medications to treat symptoms, and to slow down the progression of the disease. We test new ways to give old medications, such as testing the inhalable levodopa, which is an old medication but given in a new way. We will test older medications for new indications. For example, the old blood pressure medication called isradipine is being tested to see if it slowed down progression in Parkinson’s disease. We are studying surgeries, and this is how deep brain stimulation was approved for Parkinson’s disease. And any new type of surgery, like cell transplant or gene transplant, they have to go through these rigorous trials before being approved. We are studying non-medical interventions, like if Tai Chi or intensive physical therapy will decrease falls, or if cognitive behavioral therapy will improve anxiety in Parkinson’s. It’s important to show the benefit of these nonmedical interventions because hopefully it will encourage the insurance companies to cover them for the patients when they need them. So, who sponsors clinical studies? Everybody knows that pharmaceutical companies sponsor studies, but there are also government agencies and some private foundations. For example, the National Institutes of Health are now funding the STEADY-PD study. They are studying an old blood pressure pill called isradipine to see if it’s slowing down the Parkinson’s disease progression. Nonprofit foundations, like APDA, also fund trials. Here’s a look into the Parkinson’s research that APDA funds. As Ray James, BS, RN highlights in the webinar, you definitely want to talk with your healthcare team before participating in a clinical trial. They’re an important resource. They know you best. They help to give you a lot of options and think about a balanced approach to your decision. And when you’re ready to look for clinical trials, there are several great options. APDA Chapters and Information Referral Centers: Your community’s APDA chapter and your local Information Referral Center are great resources for clinical trial information. ClinicalTrials.gov: This is a government-funded website, and any particular sponsor that is looking to test a drug, a biological device, or has received government funding is required to submit their study to this website and have the information available to the user. So, you can put in the information you’re interested in, and get a lot of information about trials that may be available to you. There’s also a registry of completed trials there. This was enacted back in ’08 and ’09 because they want to make sure that researchers are still posting even negative results as well as positive results. The only issue with that database registry of trials is that they don’t really give you an interpretation or conclusion. They just give you the results. Very interesting website would encourage you to check it out. Fox Trial Finder: This is kind of like a matchmaking site for researchers and participants. It really helps for researchers to find eligible participants, and this is one way that people can do that. It was developed by the Michael J. Fox Foundation. CenterWatch: This is sponsored by a lot of other industry partners that put up information about trials and whether they’re ongoing or they’ve completed enrollment, and if there’s any kind of stipends or funding available to you as you participate. Parkinson Study Group: They’re a consortium of physicians and other healthcare providers from medical centers across North America, and they have expertise in clinical care as well as Parkinson’s research. They’re really trying to move forward with a lot of interesting research studies and novel therapies. For more detail into observational studies (different from clinical trials), phases of clinical trials, and clinical study design, access the webinar or read the full transcript.